Recently discovered has been a long lost video of The Wasps performing Run Run Angelica and it's now up on You Tube. Certainly I'd never seen it before and it's great that people are sharing these gems. Whenever something like this appears I always wonder what else is out there that's yet to appear. 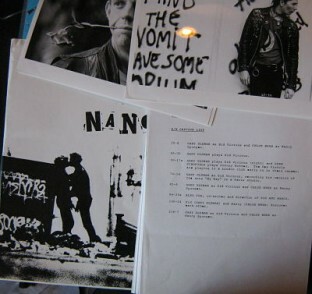 Recently acquired an interesting item for the dreadful Sid & Nancy film. It's a very nice press kit with a special folder, 8 x 10" black and white press photos from the film and 36 pages about the film. Can't have been many made! It'll be on the next newsletter/update in a week's time. Mad Sin have an excellent new video out now for Cursed. If you've not caught the band live it really is a must see experience. They're playing at this year's Durham Punk Festival on Saturday 11th September along with The Grit, Buzzcocks, Gold Blade, UK Subs, Angelic Upstarts etc.